You can’t change your shoes while you’re running. Have you ever heard the expression “it’s gonna get worse before it gets better?” If you’re talking about improving processes or ways of working in your organisation, then chances are this expression’s probably true. Any new process or change in ways of working has a wearing in period, during which time it’s easy to lose faith in the new process, or misinterpret temporarily reduced velocity as a failure of the new process. 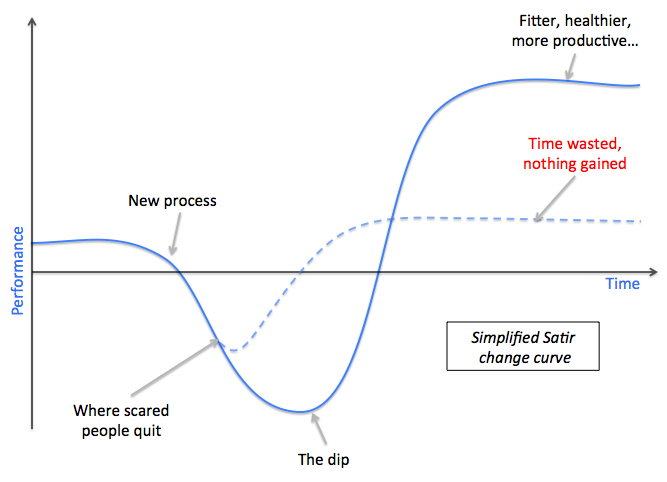 My colleague Simon recently introduced me to the Virginia Satir change curve. You can read a good explanation here but the basic premise in our context is that after any new process or change to the status quo is introduced, your productivity will at first go down, not up, while everyone gets used to the new process and while people make mistakes and learn how to deal with the new system. The best planned change management actions always result in a drop in productivity before benefits are seen. Often, people either misinterpret reduced performance as a failure of the new process, or they get scared waiting for the dip to come. The trick, then, is to not only predict this period of reduced productivity, but embrace it. Discuss it, learn from it and accept it as a normal part of healthy change. Most importantly, though: stick it out. You can’t change shoes while you’re running – you have to slow down; even stop. But once you’ve got your new shoes on, you’ll run faster. If you’re running a 100m sprint, maybe it’s not worth it. But how many software products reach the finish line after a few seconds, days or even months? This entry was posted in Software management. Bookmark the permalink.